Have you ever heard of "Stairway to heaven"? Yes, why not! It is a term that we come across quite often in literature! The stairway to heaven is one of the figures of speeches that symbolise peace, eternity and bliss, made more popular by the world famous band, Led Zeppelin. This shows how much importance staircases have got in our traditions and literature. But what if we told you that you can have stairways to heaven in your home too? Wait, don’t fume! We are not sending you to heaven right away. 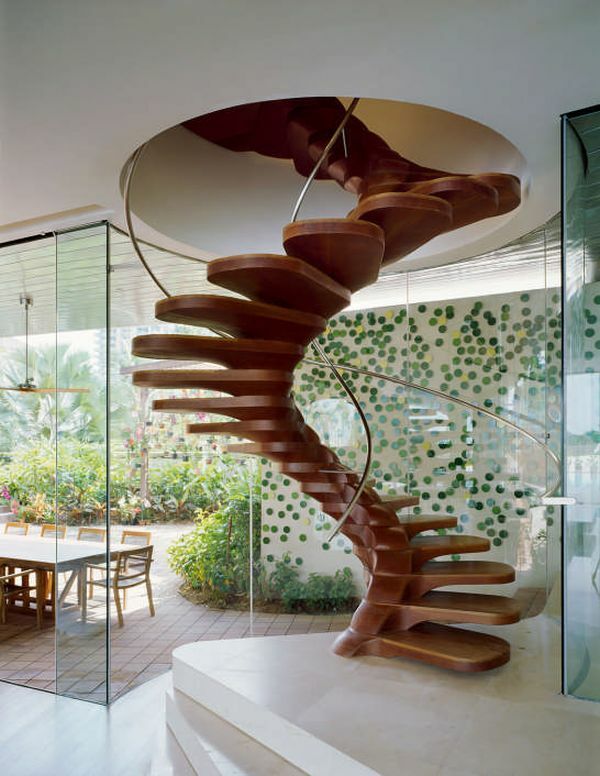 But we are suggesting you some staircase designs that will blow away your mind. What if the stairs on which you have to step appear wobbly? Will you gain confidence while climbing the staircase? Perhaps not! But when it comes to the staircase design we are showing you, matters change on the happier side. This staircase design will give you a pang of fear at first but will enrich your experience of touching the heights very soon. The staircase is basically an intensification of graphic skirting board that traces its way through the house. This staircase is bound to add elegance to your home and envy to your neighbours’ eyes. You have heard of Mc Donald’s wedges, potato wedges and even wedges in trigonometry. But you must have never imagined use of wedges in stairs. 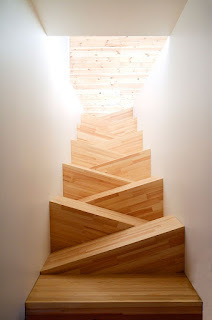 This staircase, which looks like collection of wooden wedges, does look horrifying and prone to accidents. But once you get habituated to the staircase, just imagine the fun you will experience climbing it. It must be fun to see your kid playing with your neighbour’s kid when they race on the stairs. This staircase does look cool, but you need to always wary of any accidental twist of feet. If you have an amazing taste of design and want the aesthetics of your home to be pleasant, then try out the Emmental design of staircases. It harmonizes with the interiors of your home and adds an extra touch to the living space. The white colour is quite peaceful and makes your mind serene, while you are immersing in the tranquility of the room. This staircase has been designed by Biljana Jovanovic. 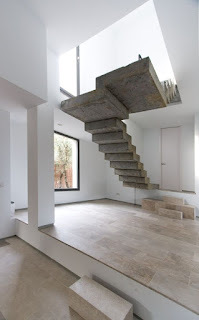 Floating staircases are common these days with fashionable homes and young interior designers. The contemporary design of staircase allows the decor of the house to remain minimalist and open, along with being airy. And no wonder, you don’t get a railing because of which it adds a touch of openness and mystic to the design. Watch out! You must not fall down while climbing these stairs. You don’t have anything hold on to in case you lose balance. Wood has always been the first choice of interior decor experts while adding elegance to the interior design. And in the case of staircases, the story is no different. Installing this staircase, which looks like many blocks of wood arranged in a spiralling fashion, will add tinge of sturdiness and historic appeal to your home. The rustic and traditional look is perfect for a home that prides itself for its traditional design on the exterior. Have you ever wondered what it would be like if you could bring the park inside your home for your kids? Has it never bothered you that your kids could not visit the park to play just because it was raining outside? If these thoughts have struck your mind ever before, then let us cheer you up. 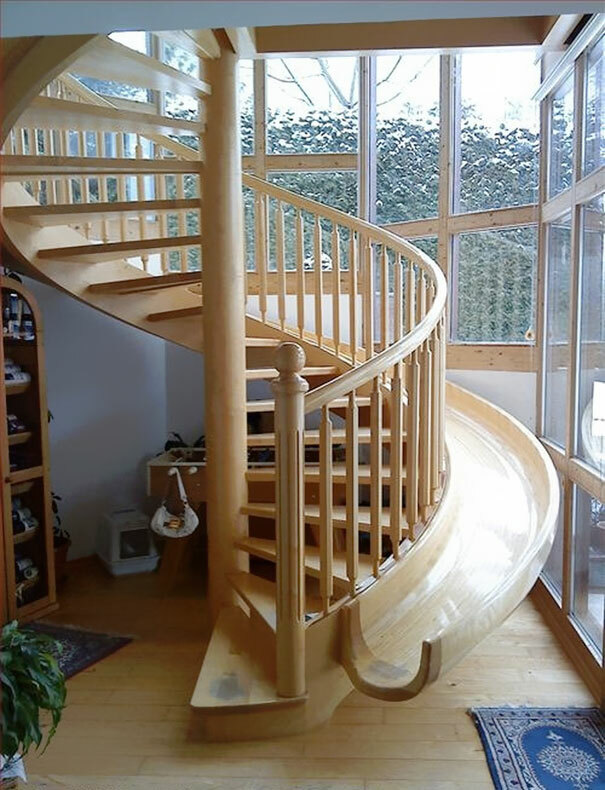 The two-in-one staircase has a slide attached to it. Now, your kids can enjoy climbing up and sliding down right inside your home. The spiral design takes fun at a different level too. Stairs are not the only things for climbing higher. Books also help to do the same. Just think, how high you will reach if books and stairs can join hands. 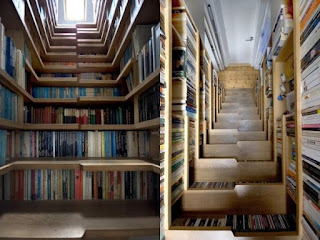 The following staircase design actually utilises the space left empty by many staircases to store books. The books are not only meant to give strength to the staircase design, but can also be kept for display in a library this manner. This gives staircase a totally different meaning for book-lovers. 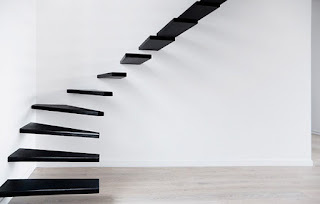 The ribbon design of staircases is quite minimalist in nature and along with the combination of two extreme colours ­– black and white, it adds a touch of modernity in the staircase design. No wonder the angles are not too smooth and the people climbing it can be prone to accidental falls. Yet, with its unique design and ability to gel well with the interiors, this staircase design will make your home look quite futuristic. The steps have to be quite smooth and not slippery. 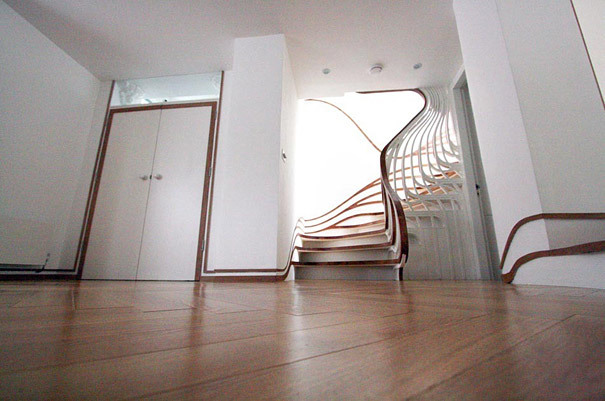 If you are still thinking about the wooden staircase that we showed you earlier, then let us show you a better design. 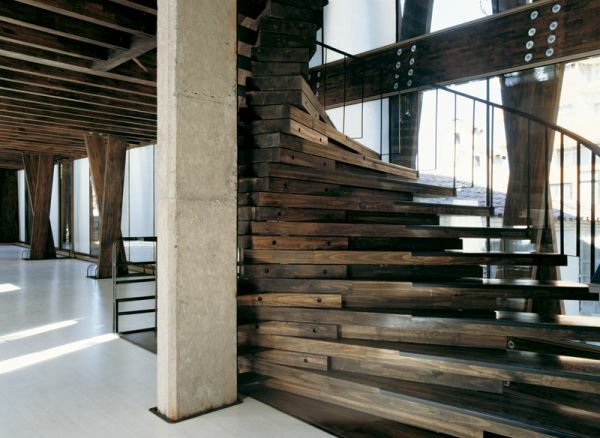 Wood makes staircases look bulky and traditional. 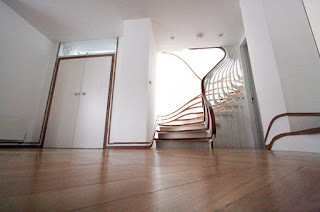 However, this staircase design is quite futuristic and is very graceful. 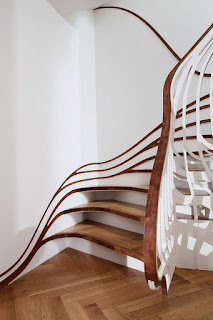 The spiral makes the staircase gain elegance and the railing on just one side and the other side being free, gives the stairs a minimalist look. It may still look a bit bulky but it is quite authentic in its looks. This is one of the designs with benefits. If you need some extra storage space, then this staircase design is best for you. The space underneath the staircase can help you to store additional items in the house and manage space efficiently. 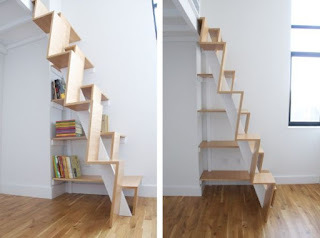 If you are in dearth of items to keep under the stairs, then you can use the space as bookshelf too. This staircase not only is creative in looks but also gives you the option of creating space in your interiors. Let’s have something as sturdy as the Hulk. How will it feel to see concrete blocks floating in the air? 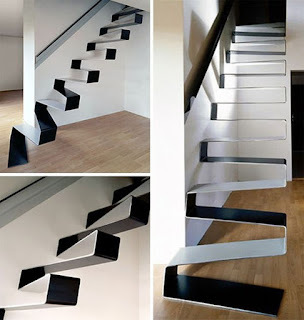 Yes, that is what this staircase design is all about. Although concrete is quite strong, yet using wood or metal may be a better option as they are light in weight. But suppose your neighbours visit you. Floating blocks of concrete will attract more eyes and raised eyebrows than floating pieces of wood or metal. Try it out! 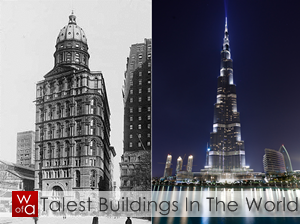 Who knows you may define the style segment of your town? What if your kids could use the swing adjacent to the stairs in a much different way? This staircase is the daddy of all the designs that we have shown you till now. 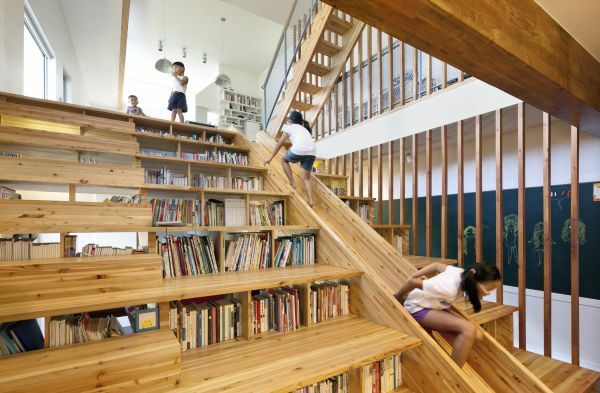 It has bookshelves, storage spaces, swings, wood and of course, steps to climb. Bring this to your home and be the pioneer of a style statement that brings a lot of features into play at once!! If you want to make climbing stairs a worthwhile experience, then go ahead and get any one of the staircase designs for your home.